I have a 47 cub that I would like to put a PTO on. It currently does not have a PTO output shaft or anything that indicates it did have one, just a flat plate on the rear end where the output would be. What do I need to do to have a PTO? Do I need an output shaft if I have a 90 degree gearbox or does that bolt on where the cover plate is on the rear end? I believe even with the 90 degree gearbox, you will need the PTO shaft ASSEMBLY, along with the PTO Adapter plate. As you can see, the gearbox bolts to the adapter plate. Dale is correct. You'll need everything in this pic from TM's website. then the 90 degree gearbox will slide onto the splined shaft, some longer bolts needed. Expect to pay $75 to $125 for the complete setup. Also, you need to make sure your drive shaft (inside the rear of the transmission) has a good pilot bushing for the tip of the PTO shaft. Overall, it would be a reasonably "easy" job...perfect for a cubfest project!! Of course, it looks like you are in California...not sure if there are any cubfests in your area. Maybe you can start one!! Thanks Dale.. No.. no Cubfest out here. It seems that the further west you get the less Cubs there are. Actually many of the local farmers out here still use the older large Farmalls but not many Cubs, it's even worse for Cub Cadets. I will have to find the parts online, maybe someone has the whole output assembly for sale. Check with form sponsors at the bottom of this page or place a WTB add on THE VINE, Classified subforum. On some cubs such as yours, I have seen the main torque shaft where the PTO shaft engages to, does not even have a place to connect. That shaft may have to be replaced as well. Some do some don't. No way to tell until that rear plate is removed. 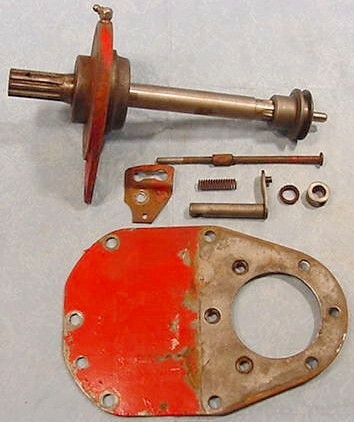 When I Googled FARMALL CUB PTO ASSEMBLY, there were quite a few results. Use various word combinations for the search. The rear end of the long clutch shaft has splines, and drives the PTO. Below are pics, from TM Tractor, of how it has to look. It has to have a hole in the end, and the Pilot Bushing goes in the hole. The ID of the bushing holds the front end of the PTO shaft. The 2nd pic shows the splines on the clutch shaft, at the right of the pic. The 3rd pic shows inside the transmission case, the shaft is at the hole in the upper part of the case. You can remove the trans oil filler plug, and look in the hole with a light, and can probably see the splines on the shaft. 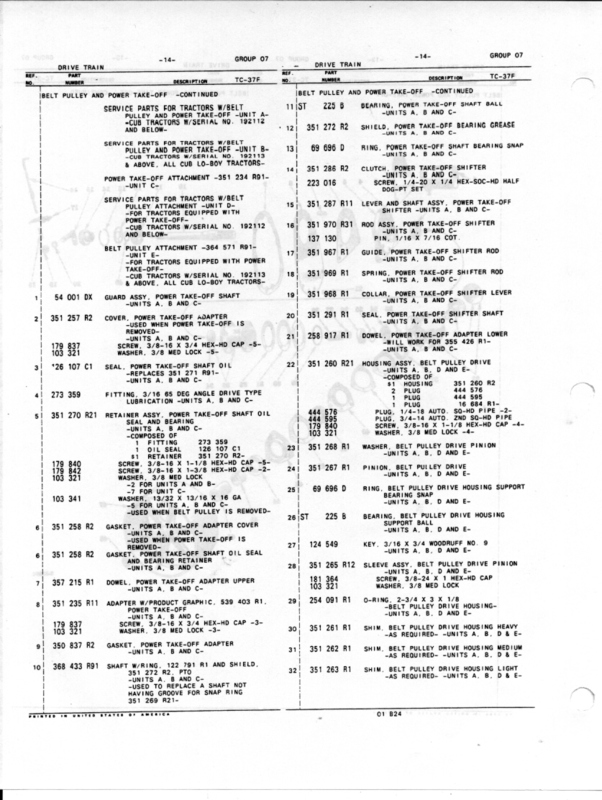 TM Tractor, at the bottom of the page, has new PTO Pilot Bushings. 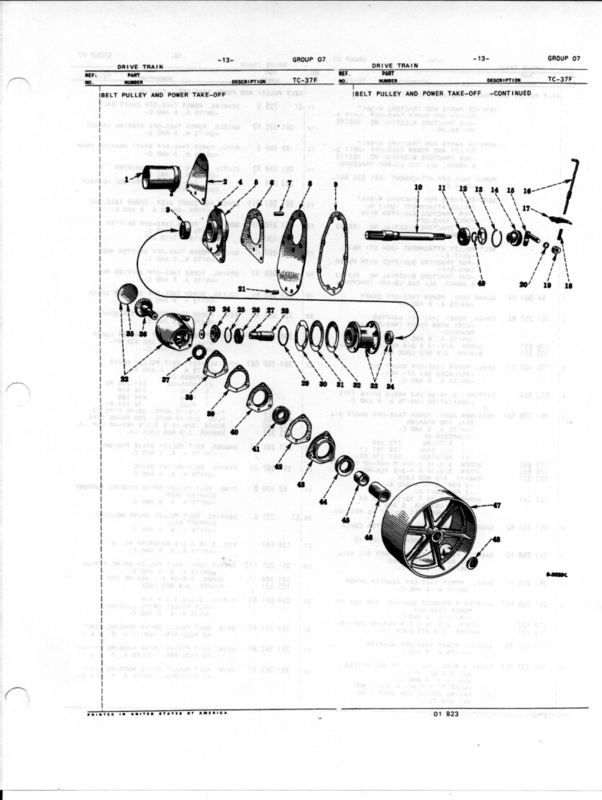 Below is the Cub service manual. The PTO is in section 6A, I would recommend reading it before working on the PTO. The Belt Pulley attachment shown there, and above in another post, is a separate unit. It goes on over the PTO shaft, you have to have the PTO to use it, but if you have nothing to use the Belt Pulley for, you don't need it. Grease the front of the PTO shaft, and inside the pilot bushing before putting the PTO in the case. Before I went to far buying parts I would verify there's a hole drilled (with a knockout in it) for the engagement lever in the side of the transmission case. Where about is the hole for the engagement lever and on which side is it. I just assumed that they were all the same just not having the option. If it doesn't have one is there a reason I couldn't modify it? Usually there is a drive in plug in the small hole for the PTO shifter if the Cub has no PTO. Remove the plug and there should be an open hole. The hole is on the right side of the transmission case, near the front corner of the battery box. 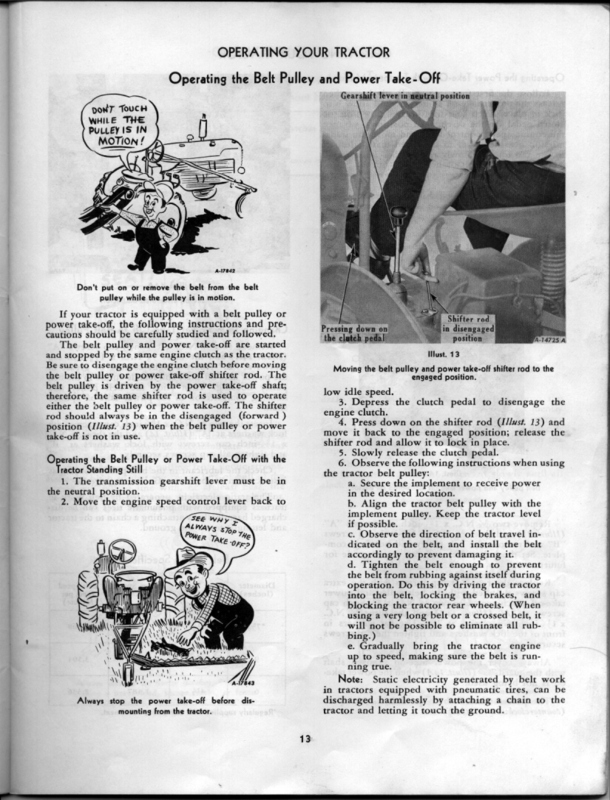 Below is a page from the Cub owner's manual showing the lever. Below is a pic from TM Tractor showing the hole, it is the open hole, half way between the front and rear of the trans case, near the top of the case. ok.. I checked for a hole. I cant see one but there is still crud I need to scrape off. I want to be positive but if there isn't one for sure is it possible to drill one? Has any ever done this?